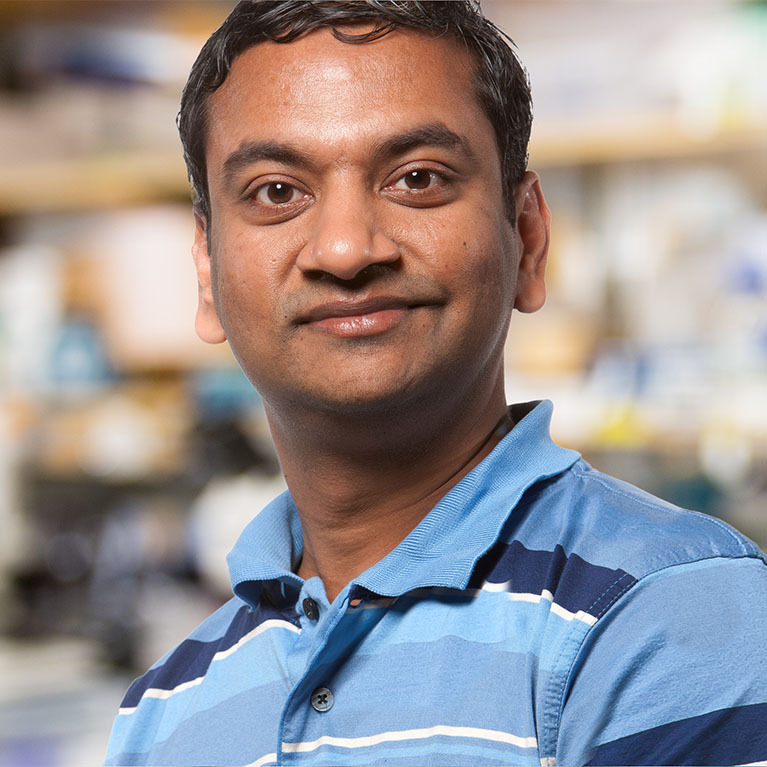 LA JOLLA—Salk Associate Professor Sreekanth Chalasani has been awarded a grant from the National Institutes of Health’s (NIH) Brain Research through Advancing Innovative Neurotechnologies (BRAIN) Initiative for developing a way to selectively activate brain, heart, muscle and other cells using ultrasonic waves, which could be a boon to neuroscience research as well as medicine. Chalasani will receive over $1 million for the first year of the award to expand his groundbreaking technology into mammalian cells. If it works in humans, such a technology could be used for deep brain stimulation—a common treatment in Parkinson’s and depression. It could also be used outside of the brain to act as a pacemaker for a heart or to produce insulin from pancreatic cells. Chalasani’s new technique, which he calls sonogenetics, has some similarities to the burgeoning use of light (optogenetics) to activate cells in order to better understand the brain, but is less invasive. This method–which uses the same type of waves used in medical sonograms–may have additional advantages over optogenetics particularly when it comes to adapting the technology to human therapeutics. Chalasani first demonstrated the technique on nematodes in 2015, showing that low-intensity ultrasound waves propagating into the worms caused a membrane ion channel called TRP-4 to open and activate cells. His team also added the TRP-4 channel and successfully activated neurons that don’t usually react to ultrasound. With the new grant, Chalsani is developing technology to deliver focused ultrasonic waves to particular regions of the mammalian brain and is also exploring additional ion channels that could be targeted with ultrasound. “I am very grateful for the support to pursue this research and see whether this technique can work in mammals and translate to humans for medical benefits,” says Chalasani, who is collaborating with additional Salk labs as well as with the University of California, San Diego on the effort. Every cure has a starting point. The Salk Institute embodies Jonas Salk’s mission to dare to make dreams into reality. Its internationally renowned and award-winning scientists explore the very foundations of life, seeking new understandings in neuroscience, genetics, immunology and more. The Institute is an independent nonprofit organization and architectural landmark: small by choice, intimate by nature and fearless in the face of any challenge. Be it cancer or Alzheimer’s, aging or diabetes, Salk is where cures begin. Learn more at: salk.edu.